It is a week since the armistice between Italy and Austria-Hungary came into effect. Since then the Italians have kept advancing into the occupation zone assigned to them by the armistice, which roughly corresponds to the territories promised to Italy by the Treaty of London. By now they have reached the Brenner Pass in the north and established an overland route to Trieste. Italian forces are also landing on the Dalmatian coast and offshore islands, to a less than warm reception from the Slav inhabitants. Thanks to the confusion of the war’s last day, when Austria-Hungary stopped fighting 24 hours before the Italians, Italy now holds a vast number of Austro-Hungarian prisoners, with some 430,000 captured in the final day. These are being held in ramshackle conditions and are now dying in large numbers. The Austro-Hungarians meanwhile are observing the terms of the armistice and have released their Italian prisoners. These were also being held in poor conditions. The food crisis in Austria-Hungary meant that their captors did not have much with which to feed them and the Italian government blocked the transfer of food parcels; as a result Italian prisoners suffered higher mortality rates than frontline combat units in the Italian army. The prisoners are relieved to finally return home, but their sufferings are not yet over. When they reach Italy they find themselves being held in internment camps, once more in poor conditions, where they are interrogated regarding the circumstances of their capture by the enemy. To the Italian authorities, surrendering is prima facie evidence of treason. There is even talk of shipping all the returning prisoners off to Libya. At the Villa Giusti outside Padua an Austro-Hungarian delegation has been presented with armistice terms by the Italians. The terms are non-negotiable; if they are not accepted the Italians will just press on and invade Austria. 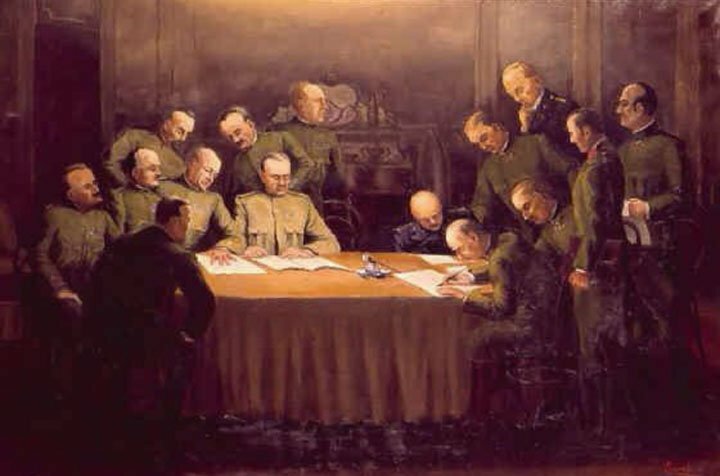 With Austria-Hungary disintegrating and the army unable to mount any resistance, the Austro-Hungarians have no choice but to agree to the Italian terms. Austria-Hungary is now obliged to release all Italian prisoners, hand over half its artillery pieces and retreat out of the territory coveted by the Italians. They must also expel all German military personnel. The armistice is meant to come into effect in 24 hours hence but the Austro-Hungarian commanders manage to make a mess of the armistice’s implementation. They tell their own troops that the armistice has taken effect immediately, ordering them to cease all resistance. But this just means that as the Italians press forward they find themselves capturing a vast number of Austro-Hungarian troops. And the Italians are indeed pressing on wherever they can, staking a claim to territories they want to be awarded in the post war settlement to come. Udine, Cadorna‘s headquarters before Caporetto, is liberated today, as is Gorizia (previously captured in 1916 during the Sixth Battle of the Isonzo). To the north Trento falls to the Italians, but the biggest prize of the day is Trieste. This great port, the target of Italian dreams since they launched their first attacks on the Isonzo, today receives its first Italian governor, General Carlo Petitti di Roreto, who arrives onboard an Italian destroyer. Austria-Hungary is being torn apart by disaffection within and defeat on the battlefield. The Allies are now advancing up the Balkans, pushing the Austro-Hungarians from territories they have occupied since 1915. Today French and Serbian troops liberate Belgrade, which brings them to the pre-war frontier with Austria-Hungary. Now of course the Empire’s southern Slav territories are seceding in the hope of forming a new state with Serbia, the very nightmare that Austria-Hungary’s leaders went to war in 1914 to prevent. On the Italian front the army is in a state of collapse. Italian troops are pressing eastward and are now across the Tagliamento. The forced evacuation of Monte Grappa meanwhile has allowed the Italians to push northwards into the Asiago plateau. The Austro-Hungarians seem incapable of further resistance here and are surrendering in large numbers; one British division attached to the Italian army here manages to capture some 20,000 prisoners for the loss of only 150 of their own men killed or wounded. In Trieste the Austrian governor has fled the city after being informed by Vienna that it is being abandoned. And in the Villa Giusti outside Padua Austro-Hungarian negotiators are presented with Italy’s armistice terms. The Austro-Hungarian army must cease fighting, surrender half its artillery and demobilise. The Austro-Hungarians must also evacuate the territories promised to Italy by the Treaty of London and place their transport network at the Allies’ disposal. They have until midnight tomorrow to accept or reject the terms. The Austro-Hungarians are being pressed hard by the Italians. Assaults on Monte Grappa have been repulsed but now the Italians have crossed the Piave in strength and are pushing towards Vittorio Veneto. Discipline is breaking down in the Austro-Hungarian army, with reserve units refusing to move up to the front and desertion rampant. Boroevic, the local Austro-Hungarian commander, reports that only German-Austrian troops in his army are proving entirely reliable (which is no doubt personally embarrassing to him as he is a Slav but one totally loyal to the Empire). When told that Emperor Karl is about to request an armistice he fears that this news will cause the army’s complete disintegration. With the enemy now advancing from the Piave, Boroevic orders a retreat to a new line on the banks of the Monticano. He hopes that his men will be able to hold the Italians here until the war ends.